Ted gambles the entire heating allowance budget on Chris the sheep to win the King of the Sheep competition. He has won it several times before and is considered a good bet to win it this time. Unfortunately, Chris doesn't feel at all well as he has heard rumours that a sheep-eating beast is on the prowl. Chris's owner, Fargo Boyle, pleads with Ted to help return Chris to his former self. Ted successfully manages to return Chris to his former self by using all manner of pampering techniques. In the meantime, however, Ted finds out that Fargo Boyle spread rumours about the beast so that Chris would be frightened and the odds against him winning the contest would dramatically increase, netting Fargo a healthy profit. On the day of the competition, Ted stages a dramatic scene and reveals the truth about Fargo's plot. Chris the sheep is disqualified. On the way home, Dougal reminds Ted that with Chris getting disqualified, he has lost the bet and therefore all the heating allowance money. The penny drops with Ted and the final scene sees them preparing to hibernate for the winter. Father Dougal: They say it's as big as four cats and it's got a retractable leg so's it can leap up at you better. And you know what, Ted, it lights up at night and it's got four ears, two of them are for listening and the other two are kind of back-up ears. Its claws are as big as cups and for some reason, it's got a tremendous fear of stamps! Mrs Doyle was telling me that it's got magnets on its tail, so's if you're made out of metal it can attach itself to you and instead of a mouth, it's got four arses!" Alan: Should I call the police, Father? Father Ted: No. He's lost the trust of his sheep. That's punishment enough for a farmer who deals primarily...with sheep. Sixth and final appearance of Mary and John. John locks Mary in a cupboard. Dougal has a They don't Exist List. It contains: The Loch Ness Monster, Frankenstein, Magnum P.I, Non-Catholic gods, Darth Vader, The Beast and The Phantom of the Opera. During leap years Jack is affected by the changing of the seasons and for a short time a marvellous serenity enters his life and he is at one with nature. Mrs Doyle has some special Sheep tea just for sheep. 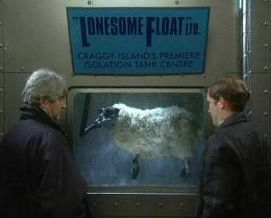 To bring Chris the sheep back to his old self Ted and Dougal give him a boat ride, make him listen to an Ambient moods record and take him to a flotation tank. 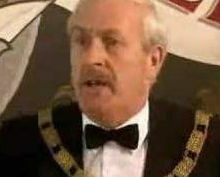 Dougal takes to recording his conversations just to check he said what people say he said. When Ardal O'Hanlon talks of the beast having four arses this was made up on the spur of the moment. He thought the original line simply wasn't funny enough. The title is a play on words. Chirpy Chirpy Cheep Cheep was a 1971 song by the band Middle of the Road. It was a number one chart hit in the UK.